In September 2015, agreement was reached at the UN on the 2030 Agenda for Sustainable Development, including 17 Sustainable Development Goals (SDGs) and corresponding targets to be achieved by 2030. 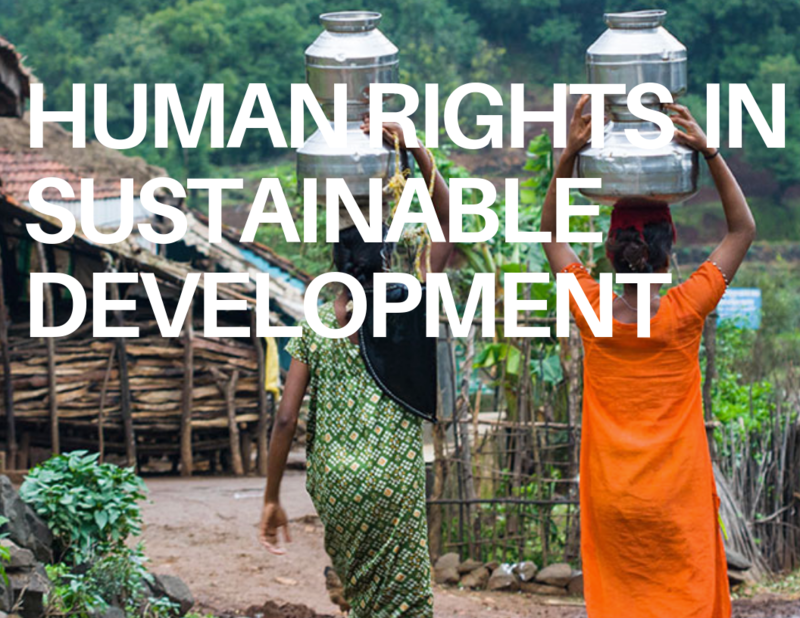 In the years prior to the Agenda’s adoption, CESR’s analysis and advocacy played a leading role in ensuring that human rights standards and principles were reflected in the new development agenda, including by co-convening the Human Rights Caucus. In doing so, we were informed by the experience of the Millennium Development Goals, many of whose targets remained unfulfilled and whose legacy from a human rights perspective is in many respects problematic. As a result, a number of significant human rights commitments are reaffirmed in the 2030 Agenda, which is explicitly anchored in international human rights standards and affirms “realizing human rights for all” as its goal. This is important, as the Agenda will determine development priorities at the national, regional and global levels from here to 2030. Nevertheless, persistent pressure and new policies are necessary to shift the trajectory of global development onto a just, sustainable and human rights-realizing path. In particular, CESR has been advocating for human rights-informed implementation and monitoring of the commitments to tackle inequalities, including economic inequality and gender inequality (particularly Goal 10 and Goal 5). To do this, States will need to take a new approach to economic and social policies, one that is rights-based and redistributive. CESR’s policy brief, From Disparity to Dignity: Tackling economic inequality through the Sustainable Development Goals, examines the human rights issues at stake in SDG10 and offers a set of rights-based policy proposals to ensure the promise of this goal is fulfilled. Drawing on human rights standards, the briefing explores a critical set of redistributive policiesin the areas of social protection, health, education and taxation–that are key to tackling economic inequality from a human rights perspective. It also explains the equally crucial “pre-distributive” policies, such as employment and labor rights, care and family leave, and financial regulation. Together, these progressive policies can allow States to take meaningful steps towards meeting Goal 10 and reducing inequality. Furthermore, the briefing underlines the urgency of coordinated action at the global level to tackle the structural factors fueling inequality both within and between countries, such as cross-border tax abuse and democratic deficits in global economic governance. CESR is also involved in the Reflection Group on the 2030 Agenda and is co-publisher of the annual Spotlight on Sustainable Development Report. This civil society-led SDG accountability initiative provides a critical and comprehensive assessment of implementation of each of the 17 goals. CESR’s contributions to the Spotlight Report focus on the obstacles to tackling inequality, reducing wealth concentration and ensuring sufficient, equitable financing for human rights and sustainable development, as well as drawing on its long-standing role in advocating for robust and rights-based monitoring and accountability of the Goals. In order for the SDGs to be the transformative agenda promised, States must be held accountable to their commitments to reduce inequalities and “leave no one behind.” To this end, CESR participates annually in the UN High-Level Political Forum on Sustainable Development (HLPF), conducting advocacy, providing analysis and highlighting inconsistencies and deficiencies in the official SDG narrative for the broader human rights and development communities. Who Will be Accountable for the SDGs? Key CESR publications relating to the SDGs. An Overview of the Agenda 2030 and its SDGs: What is the status of implementation? New SDG progress report confirms civil society fears that weak monitoring is undermining the agenda. A contribution to the openGlobalRights debate on economic inequality and human rights by CESR's Kate Donald. ﻿﻿﻿As the UN Statistical Commission debates final proposals for the SDG indicators, there is serious concern over the absence of a robust measure of inequality. Four months have now passed since Agenda 2030 was agreed, but the crucial matter of designating indicators to measure progress remains in the balance. There is one critical area where the SDGs fall dangerously short – accountability. Read the new blog by Kate Donald, Director of CESR's Human Rights in Development Program. UN adopts Agenda 2030, but will governments follow through? Statement: CESR responds to Agenda 2030, the new sustainable development goals for the next 15 years adopted by member states at the United Nations.